Set up in 1976 to provide a quiet oasis from our motorized world, Hoist Lakes Foot Travel Area is a 10,600-acre slice of the Huron National Forest west of Harrisville where mountain bikes, horses, vehicles and outboard motors are banned. The tract contains more than 20 miles of trails and a handful of walk-in campsites, making it the ideal destination for a weekend backpack. The Hoist Lakes Loop is a 5.4-mile trek that begins from the eastern trailhead, the Bryon Lake Loop is a 7.6-mile hike from the western trailhead. Both lead to walk-in campsites and backcountry fishing opportunities. 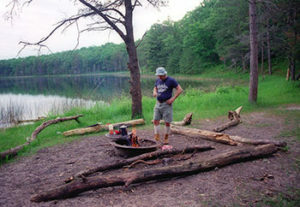 Nearby and also part of the Huron National Forest is Reid Lake Foot Travel Area, a 4,000-acre non-motorized tract that includes 12 miles of trails, eight backcountry campsites, two charming lakes and numerous wetlands, marshes and bogs. The foot travel area experiences its heaviest use on winter weekends with skiers but Reid Lake is also popular with hikers or backpacker who follow Reid Lake Loop to spend the night at walk-in sites along the 13-acre lake. 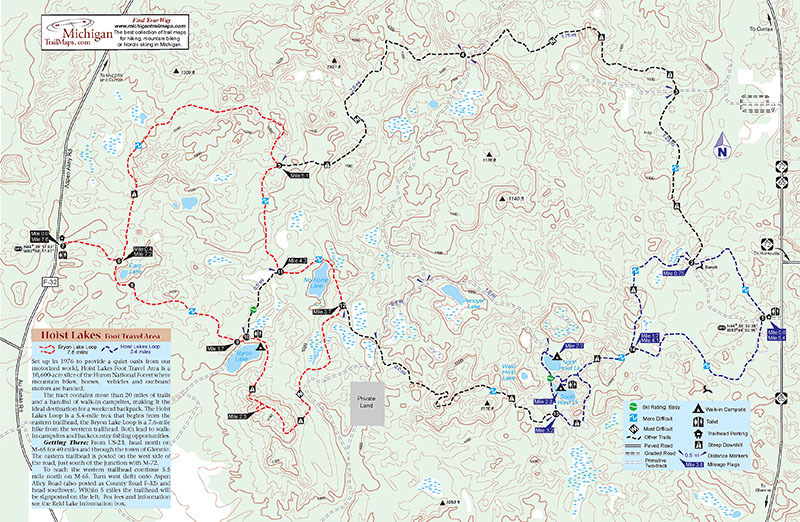 The Hoist Lakes & Reid Lake Foot Travel Areas map is part of the Classic Trails of Michigan series from MichiganTrailMaps.com, your trusted companion for trail information. The large format map measures 11 by 17 inches, is printed on durable card stock and coated to be water resistant. Includes all distance markers, contour lines, historic buildings and ruins. Best of all, when folded it fits in your back pocket or the side pouch of your pack.